With wide application of virtualization technology, the demand is increasing for performance analysis and system diagnosis in virtualization environment. There are some profiling toolkits based on hardware events, such as OProfile in native Linux and Xenoprof in Xen virtual machine environment. However, sometimes users in different domains need monitor different hardware events individually at the same time. For programming and profiling in environment for virtual machine, it may become popular in the coming future. In this paper, we present Metis, a system-wide profiling toolkit for Xen virtual machine environment based on the virtualization of hardware performance counters. Virtualization of hardware performance counters is used to enable profiling of processes and routines running in the domain or Xen virtual machine monitor. This toolkit allows multiple users in different domains to monitor different hardware events simultaneously in Xen virtual machine environment, obtaining the distribution of hardware events such as clock cycles, instruction execution and cache misses, etc. Our experiments with a real-world benchmark demonstrate the good performance of Metis. Comparing to all the existing profiling toolkits, Metis is different which enables multiple users in different virtual machines to monitor different CPU events simultaneously, and users in different domains can use this toolkit individually without affecting each other. We apply a popular benchmark to verify the correctness of Metis and its cool features. Virtualization technology allows multiple Virtual Machines (VMs) running on a single physical host. Each VM can run different Operating System (OS), applications in respective OS can run individually without affecting each other. Many enterprise applications traditionally running on dedicated servers consolidate to a smaller and shared pool of servers . Xen is an x86 virtual machine monitor, which allows multiple commodity operating systems to share conventional hardware in a safe and resource managed fashion without sacrificing either performance or functionality . Even some cases for high performance computing with virtual machines can achieve almost the same performance as those running in a native, non-virtualized environment [3, 4]. With the wide application of virtualization technology, the demand is increasing for performance analysis and system diagnosis in virtualization environment . Xenoprof is a system-wide statistical profiling toolkit, which is modeled on the OProfile profiling toolkit and available for Linux systems. The Xenoprof toolkit supports system-wide coordinated profiling in a Xen environment to obtain the distribution of hardware events, such as clock cycles, instruction execution, TLB and cache misses. However, since domains (Xen uses the term "domain" to refer to a virtual machine) are in a coordinated profiling session when Xenoprof is used, they should have the same hardware events configuration and obtain respective performance data. Sometimes, users in different domains may have the demand to monitor different hardware events simultaneously. For example, a user is in A domain, and want to monitor two events, such as CPU_CLK_UNHALTED and ITLB_MISS_RETIRED, while another user logs in B domain and need to use another two hardware events such as DTLB_MISSES and BUS_TRAN_MEM at the same time. A new profiling toolkit is preferred to make multiple users monitor different events individually at any time without affecting each other. In this paper, we present Metis, a system-wide profiling toolkit for Xen virtual machine environment. It is depended on the virtualization of hardware performance counters. This toolkit enables profiling of processes and routines running in domain or Xen virtual machine monitor (VMM, which is intrigued both researchers and entrepreneurs ). It allows multiple users in different domains to monitor different hardware events simultaneously in Xen virtual machine environment, for obtaining the distribution of hardware events such as clock cycles, instruction execution, TLB and cache misses, etc. Though the number of hardware performance counters is limited, the number of hardware events that a domain can monitor is also dependent on it because of the virtualization of hardware performance counters. We present an experiment in a physical host with two hardware performance counters, and monitor two events (CPU_CLK_UNHALTED and ITLB_MISS_RETIRED) in a domain, while another two events (DTLB_MISSES and BUS_TRAN_MEM) are monitored in another domain. It shows the effect of the virtualization of hardware performance counters in detail. Besides this, we report on the use of Metis to analyze performance overheads for Gzip (a benchmark in SPEC CPU2000) by monitoring two hardware events such as CPU_CLK_UNHALTED and ITLB_MISS_RETIRED. Two users in two different domains start and stop Metis simultaneously in the experiment, and we compare the performance data with the output produced by Xenoprof. The rest sections are organized as follows. Section 2 discusses the related works about profiling toolkits. Section 3 details the design and implementation of Metis on Xen. In Section 4, we test Metis with popular benchmark and analyze the experiments. We draw the conclusion in section 5. There are a few profiling toolkits which use hardware performance counters, such as OProfile, VTune in native Linux and Xenoprof in Xen virtual machine environment. In this section, we briefly describe these toolkits, and then we present our motivation for this work. OProfile is a system-wide statistical profiling tool for Linux systems. We can use OProfile to profile code executing at any privilege level, including kernel code, kernel modules, user level applications and user level libraries. OProfile uses performance-monitoring hardware on processors to collect periodic samples of various performance data. Performance monitoring hardware on modern processor architectures include counters that track various processor events including clock cycles, instruction retirements , TLB misses, cache misses, branch mis-predictions, etc. Researchers can configure the performance-monitoring hardware to notify the operating system when these counters reach specified values. Profiles are generated by regularly sampling the current registers on each CPU and converting the runtime PC value into something meaningful to the programmer. OProfile achieves this by taking the stream of sampled PC values, along with the detail which task was running at the time of the interrupt, and converting it into a file offset against a particular binary file. Because applications map the code that they run by using mmap(), it's possible to find the relevant binary file and offset by walking the task's list of mapped memory areas. Then the user-space tools can reconstruct where the code came from, including the particular assembly instructions, symbol, and source line (via the binary's debug information if present). User provides input for OProfile about the performance events to be monitored and the periodic count. OProfile programs hardware counters to calculate the number of user-specified performance events and to generate a non-maskable interrupt (NMI) when the counter has counted to the user-specified count. The performance-monitoring hardware generates an NMI according to counter overflow. OProfile's NMI handler catches the NMI and records the program counter value in a kernel buffer. OProfile processes the buffer periodically to determine the routine and executable corresponding to the program counter on each sample in the buffer. This is determined by consulting the virtual memory layout of the process and the kernel. Intel VTune Performance analyzer is a commercial application for software performance analysis about Intel-manufactured x86 and x64 based machines, and has both GUI and command line interfaces. It is available for both Linux and Microsoft Windows operating systems. Intel VTune Performance analyzer assists in various kinds of code profiling including time-based profiling, event-based profiling. The profiler result consists of details such as time spent in each sub routine, which is drilled down to the instruction level. The time taken by the instructions is indicative of any stalls in the pipeline during instruction execution. The tool can be also used to analyze thread performance [9, 10]. 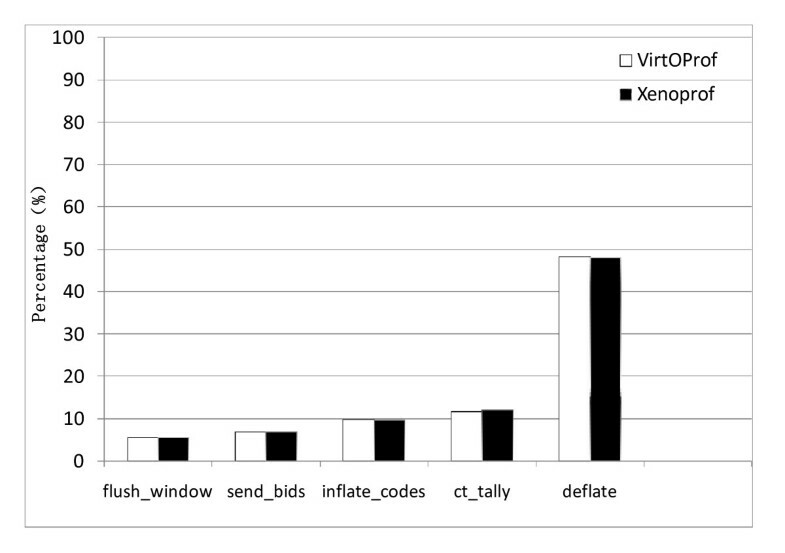 Xenoprof is a system-wide profiler for Xen virtual machine environments, capable of profiling the Xen VMM, multiple Linux guest operating systems, and applications running on them . The Xenoprof toolkit provides capabilities similar with OProfile for the Xen environment (i.e., using performance-monitoring hardware to collect periodic samples of performance data). 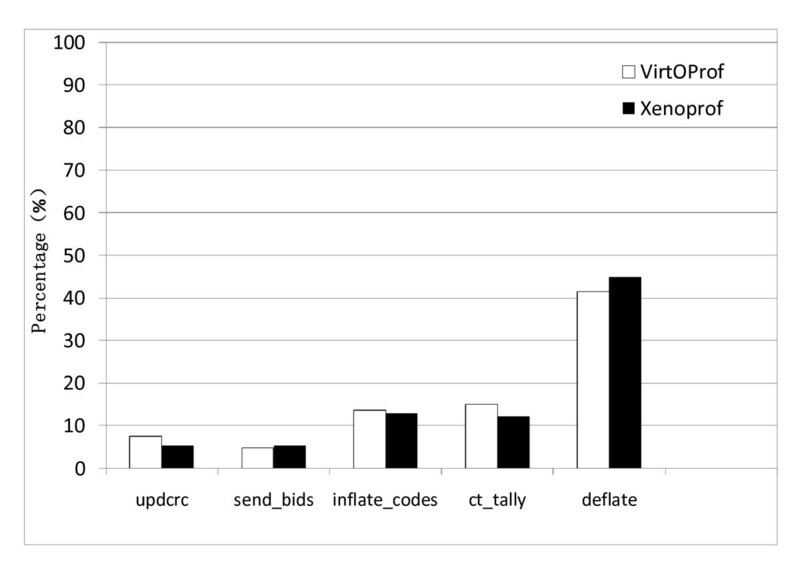 The performance of applications running on Xen depends on interactions among the application's processes, the operating system it is running on, the Xen VMM, and potentially other virtual machines (e.g., driver domain) running on the same system. In order to study the costs of virtualization and the interactions among multiple domains, the performance profiling tool must be able to determine the distribution of performance events across routines in the Xen VMM and all the domains running on it. In virtual machine environments like Xen, a major source of performance degradation is the cost of I/O devices virtualization to allow multiple guest VMs to share a single device securely , and we can use Xenoprof to measure the I/O performance meanwhile. We also use information extracted by Xenoprof to uncover bugs and channel the information into optimizing Xen, to provide a view of their application on virtual machines for a scientist or an application's user . In , researchers use Xenoprof for memory intensive applications such as DGEMM. The Xenoprof toolkit consists of a VMM-level layer responsible for servicing counter overflow interrupts from the performance monitoring hardware and a domain-level layer derived from OProfile responsible for attributing samples to specific routines within the domain . The OProfile layer drives the performance profiling through hypercalls supported by Xenoprof and Xenoprof delivers samples to the OProfile layer using Xen's virtual interrupt mechanism. System-wide profiling is generated through the coordination of multiple domain-level profilers. While our current implementation is dependent on OProfile, other statistical profilers (e.g., VTune) also can be ported for using the Xenoprof interface. We modify the profiler code for accessing and programming the hardware counters by using the Xenoprof virtual event interface. Before starting profiling, the profiler queries Xenoprof to determine whether it is to take on the role of the initiator. Only the initiator domain performs the global profiling setup, such as deciding the events and profiling duration. Both the initiator and the other profilers register their callback functions for collecting PC samples. We extend the profiler with access to the Xen virtual memory layout, so that it can identify Xen routines corresponding to PC samples in Xen's virtual address range. We put forward a system-wide profiling toolkit for Xen virtual machine environment, which is dependent on the virtualization of hardware performance counters. This toolkit enables multiple users in different domains to profile different hardware events simultaneously in Xen virtual machine environment, without affecting each other. The toolkit consists of two parts: kernel level and user level. Key processing are mainly concentrated in the kernel level (including Xen and Linux), such as the configuration and virtualization of hardware performance counters, sampling mechanism and etc., while use-space daemons of virtual machines are primarily used to analyze samples from the buffer in the kernel which are connected with corresponding functions or sections. Finally, the performance analysis data is shown for users clearly. The framework of this toolkit is as follows in Figure 1. Step 1 A background daemon is running in each privileged domain or guest domain to monitor the operations triggered by users, such as starting or stopping profiling. Step 2 The user in respective privileged domain or guest domain sets the CPU events to profile. If the count of CPU events in a domain is bigger than the number of hardware performance counters, the user will be alerted that he should reduce the number of CPU events, and then repeat this step. Step 3.2 After the user in a domain sets CPU events to monitor and starts profiling, add corresponding CPU event item for this domain in respective structures of VCPU. Step 4 If the total count of all CPU events is bigger than the number of hardware performance counters in the machine, the virtualization of hardware performance counters is used, and go to step 5. Otherwise, go to step 6 directly. Step 5Start the virtualization of hardware performance counters (time-sharing multiplexing technology). Step 6 Start sampling mechanism in kernel level. When the current count of a CPU event in a hardware performance counter reaches the number set for such CPU event, an interrupt occurs to record current PC (program counter) value and other context information, and save the information into corresponding buffer, and meanwhile the system reset counter value. The sampling data is distributed to respective domain for analysis by user-space daemons later. Step 7 When profiling stops in a domain, a stopping signal is sent to privileged domain, and corresponding CPU event item is removed from respective structures of VCPU. Step 8 The user-space daemons are in charge of the analysis of samples received from the buffer, and after this processing we can get the hotspot, even the source code line (which causes the hotspot) will be obtained if debug information exists. Step 9 Users can custom the display of performance data on their own demand, such as function calling diagram, the hotspots (functions or modules), etc. In computers, hardware performance counters, or hardware counters are a set of special-purpose registers built into modern microprocessors to store the counts of hardware-related activities within computer systems. Advanced users often rely on those counters to conduct low-level performance analysis or optimizing. The number of available hardware counters in a processor is limited while each CPU model might have many different events that a developer might like to measure. Each counter can be programmed with the index of an event type to be monitored, like a L1 cache miss or a branch misprediction . Regard Intel Itanium 2 performance monitoring unit as an example, it organizes the counters as four pairs of performance event monitoring registers. Each pair is composed of a Performance Monitoring Configuration (PMC) register and Performance Monitoring Data (PMD) register. The PMC selects the performance event monitored and the PMD determines the sampling interval . For example, in user space, when we want to set the PMC register, we can call perfmonctl with the parameter cmd valued PFM_WRITE_PMCS, while the parameter cmd will be set to PFM_WRITE_PMDS if we need to set the PMD register. In Xen, functions such as xenpfm_write_pmcs or xenpfm_write_pmds will be called to set the hardware performance counters. The privileged virtual machine is called Dom0, while a guest virtual machine is called DomU. 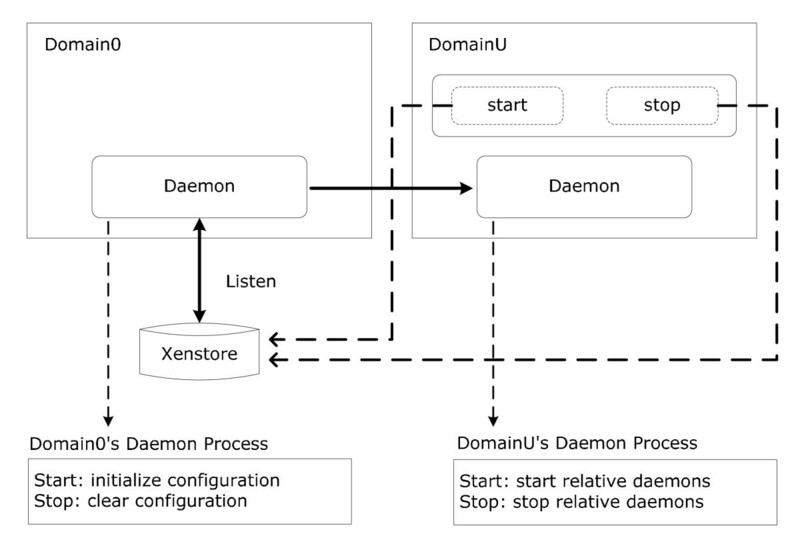 We run specific daemons in Dom0 and DomU, in which place users are willing to use this profiling toolkit, and use Xenstore as the message delivery mechanism in domains. Xenstore is a database for Xen applications and drivers to communicate and store configuration information. Applications and tools should use the store to configure drivers by writing information into keys in the database; drivers should set watches on the appropriate keys and respond to changes appropriately . Xenstore is an information storage space shared between domains. It is meant for configuration and status information rather than for large data transfers. Each domain gets its own path in the store, which is somewhat similar in spirit to procfs. When values change in the store, the appropriate drivers are notified . When Dom0 starts profiling, it will use Xenstore to send a signal. As soon as the background daemon in Dom0 catches the signal, it will initialize the beginning processes and start relative daemons. Finally, we clear relative information in Xenstore. When Dom0 stops profiling, the process is similar to starting (shown as Figure 3). Start or stop profiling in Dom0. Start or stop profiling in DomU. Virtualization of hardware performance counters. Step 1 when a VCPU is scheduled out while another VCPU is scheduled in, judge whether these two VCPU belong to the same virtual machine. 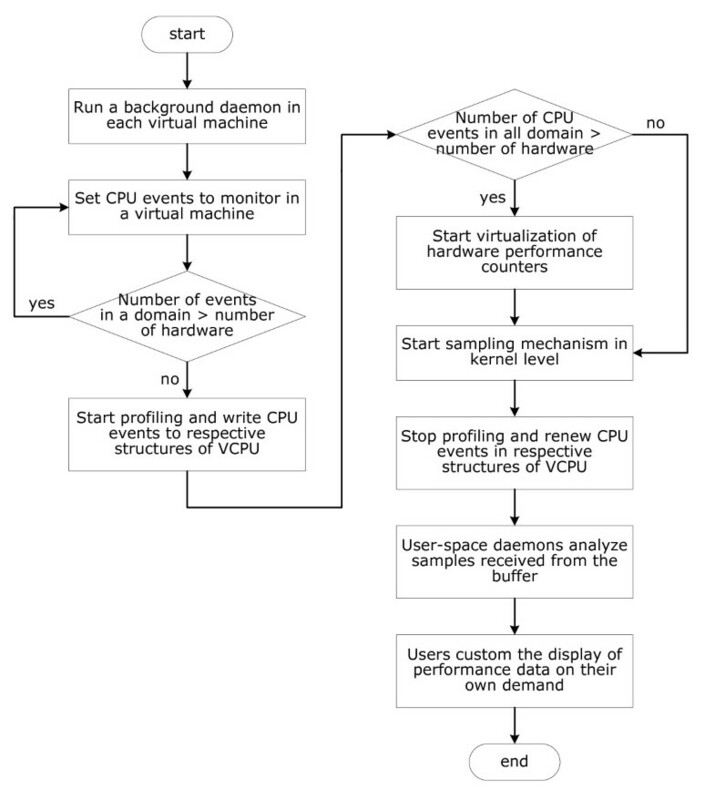 If yes, do nothing to hardware performance counters during this VCPU schedule period, and skip step 2 and step 3. Otherwise, do step 2. Step 2 Read the values of hardware performance counters responding to the respective CPU events for the virtual machine, which the previous VCPU belongs to, and store them for restoration when the virtual machine is scheduled to run next time. Step 3 Read the stored counts of respective CPU events for the virtual machine, which the next VCPU belongs to, meanwhile get CPU events configured by the virtual machine, and reconfigure the hardware performance counters for CPU events monitored by the virtual machine to run. To ensure the profiling accuracy, we put read/write operations of hardware performance counters in the VMM time slice instead of VCPU time slice, as we can see in Figure 6. During this process, we always need to restore or reset the hardware performance counters to satisfy the need of monitoring different CPU events in different domains. This operation will affect little to running domains and help reduce some performance cost in domains. A way to ensure profiling accuracy. Because hardware performance counters are generally used by a certain profile toolkit instead of other processes, we ignore the samples corresponding to the processes on hardware performance counters during the analysis of samples, which can reduce the interference from hardware performance counters. In this section, we present an experiment on a physical host with two hardware performance counters, to monitor two events (CPU_CLK_UNHALTED and ITLB_MISS_RETIRED) in a domain, while another two events (DTLB_MISSES and BUS_TRAN_MEM) are monitored in another domain. It shows the effect of the virtualization of hardware performance counters. Besides this, we report the use of Metis to analyze performance overheads of Gzip (a benchmark in SPEC CPU2000) by monitoring two hardware events such as CPU_CLK_UNHALTED and ITLB_MISS_RETIRED. Two users in two domains start and stop Metis simultaneously in the experiment, and we compare the performance data with the output produced by Xenoprof. We built our experimental environment on a server, which has 4 Intel Xeon 1.6 GHz CPUs, 4 GB DDR RAM and 150 GB hard disk. We used Linux 2.6.18 with Xen 3.3.1 installed as the operation system. 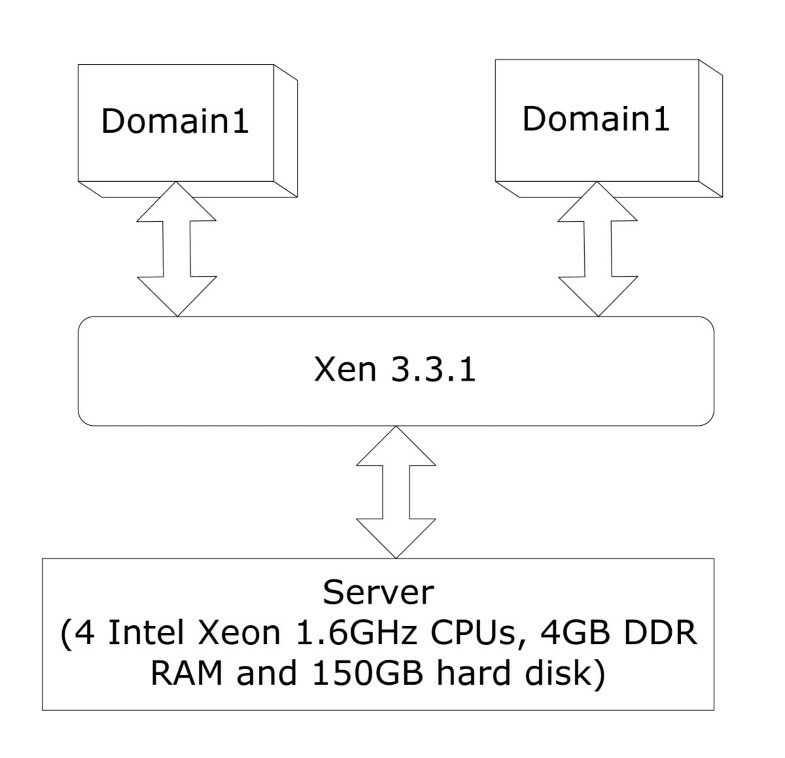 We run Xen with two guest domains configured with equal resource allocations . In all cases the VM was configured to have a single CPU with 512 MB of RAM, and installed a Red Hat Enterprise Linux 5.3 as guest OS. To execute evaluation, we create our test environment where two domains (domain1 and domain2) run. The experiment environment is listed as Figure 7. We present two experiments in this section. One is to prove that Metis enables two domains to monitor different CPU events simultaneously without affecting each other. Another is used to compare the performance data generated by Metis with the result produced by Xenoprof when the gzip benchmark is running. We can use this profiling toolkit individually in either domain1 or domain2, which enables domain1 and domain2 to monitor different CPU events simultaneously. For example, we monitor CPU_CLK_UNHALTED and ITLB_MISS_RETIRED in domain1, while DTLB_MISSES and BUS_TRAN_MEM are monitored in domain2 at the same time. There are two hardware performance counters in the server, so each domain can monitor two CPU events each time without affecting each other. We have done an experiment in two domains (and two domains are enough for indicating advantage of VirtOprof). We use domain1 to represent a priviledged domain, while domain2 is used to represent a guest domain, and more guest domains are not necessary because they share all CPU time slices and will not affect each other. We monitor CPU_CLK_UNHALTED and ITLB_MISS_RETIRED in domain1, while DTLB_MISSES and BUS_TRAN_MEM are monitored in domain2 at the same time. We start and stop Metis in two domains simultaneously, and respective performance data can be obtained. We can use Metis to get the performance data of each running domain. In Figure 8, we can get CPU usage rate of each symbol, and it is clear that the symbol named "xen-syms-3.3.1" and the symbol named "vmlinux-2.6.18.8-xen" consumed most of CPU resources. 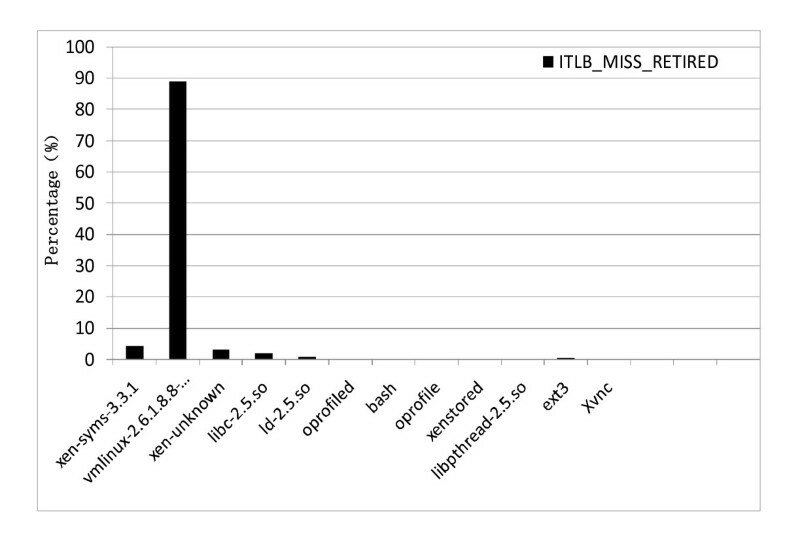 In Figure 9, we can get ITLB miss rate of each symbol, and it's seen that the symbol named "vmlinux-2.6.18.8-xen" generated most of ITLB misses, while ITLB miss rate of the symbol named "xen-syms-3.3.1" and the symbol named "xen-unknown" are followed it. 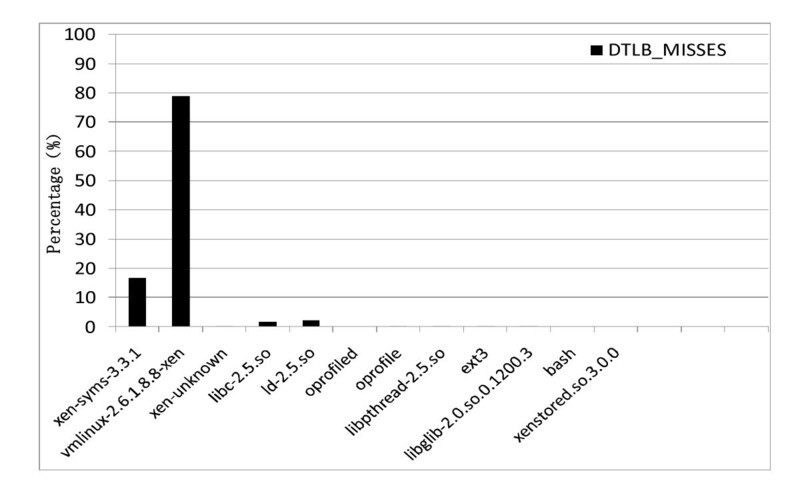 In Figure 10, we can see that the symbol named "vmlinux-2.6.18.8-xen" is the main source of DTLB misses, while the symbol named "xen-syms-3.3.1" is followed. Moreover, these two symbols take up most of the whole samples. 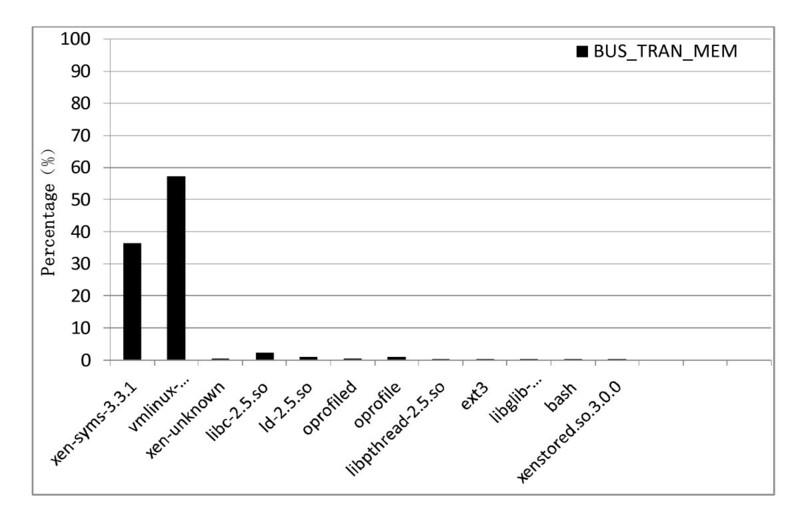 In Figure 11, we can get BUS_TRAN_MEM sample rate of each symbol, and it is shown that the symbol named "vmlinux-2.6.18.8-xen" generated more than a half of total samples, while the symbol named "xen-syms-3.3.1" takes up about one third. We can see that Metis allows two different domains to monitor different CPU events individually, which cann't be supported with Xenoprof, which is based on hardware performance counters in Xen environment. SPEC CPU2000 is the next-generation industry-standardized CPU-intensive benchmark suite. SPEC designed CPU2000 to provide a comparative measure of compute intensive performance across the widest practical range of hardware. The implementation resulted in source code benchmarks and developed from real user applications. These benchmarks measure the performance of the processor, memory and compiler on the tested system . Gzip is a benchmark in SPEC CPU2000. We choose it running in a virtual machine to compare the performance data generated by Metis with the output produced by Xenoprof. Two CPU events are monitored, such as CPU_CLK_UNHALTED and ITLB_MISS_RETIRED. We finally get the CPU usage rate and ITLB miss rate of each function in Gzip. From Figure 12 and 13 above, we can see top 5 hotspots of Gzip when CPU_CLK_UNHALTED and ITLB_MISS_RETIRED are monitored, and the performance data generated by Metis nearly match the result generated by Xenoprof. 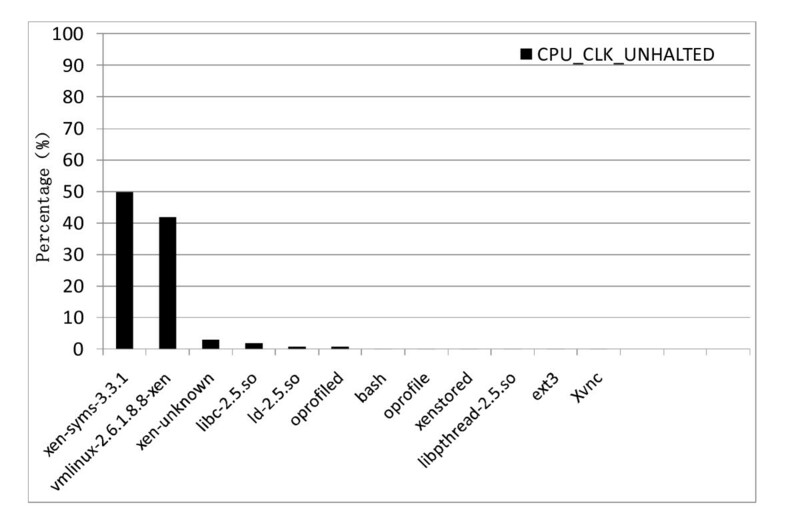 Comparison histogram of CPU_CLK_UNHALTED between VirtOprof and Xenoprof. Comparison histogram of ITLB_MISS_RETIRED between VirtOprof and Xenoprof. In this paper, we present the design and implementation of a system-wide profiling toolkit: Metis. Comparing to all the existing profiling toolkits, Metis is different which enables multiple users in different virtual machines to monitor different CPU events simultaneously, and users in different domains can use this toolkit individually without affecting each other. To make Metis used individually, we choose to run background daemons in domains to profile for answering requests in time, and use the virtualization of hardware performance counters to satisfy our need. We modify Xen source code and Linux source code to support the virtualization of hardware performance counters. Besides this, a set of user level daemons are used too as the management unit in the toolkit, and we ensure the profiling accuracy in our implementation. We apply a popular benchmark to verify the correctness of Metis and its cool features. This work is supported by National 973 Basic Research Program of China under grant No. 2007CB310900 and National Natural Science Foundation under grant No.61003007. Xia Xie carried out the Metis architecture framework, participated in the message delivery mechanism design and drafted the manuscript. Haiou Jiang and Wenzhi Cao carried out performance evaluation. Pingpeng Yuan participated in analyze message delivery mechanism. Hai Jin and Tianruo Yang participated in its design and coordination and helped to draft the manuscript. All authors read and approved the final manuscript.